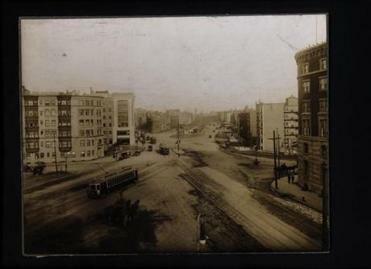 The Fenway and Kenmore Square, known as Governor’s Square in 1914 (below), have undergone a remarkable period of renewal in the last decade. As Fenway Park turns 100 this season, the neighborhood around it is finally growing up. For decades the Fenway and Kenmore Square seemed frozen in the 1950s, filled with nondescript buildings and game-day parking lots. On Boylston Street, fast food restaurants and car washes sprouted next to gas stations, forming a mini Route 1 between the Back Bay and Brookline. But in the last decade - as the Red Sox owners have restored Fenway Park itself - the blocks around the ballpark have undergone an extraordinary period of renewal: Boylston Street and Brookline Avenue are bustling with a dozen new restaurants; former parking lots are now filled with sleek apartment buildings; and hundreds of new residents add constant street life to the area. To be sure, there remains plenty of work to do. Traffic constantly clogs Boylston Street, which in places feels about as walkable as a minefield. And there are plenty of empty storefronts and time-worn retail outlets. Developers are steadily advancing new building projects. John Rosenthal hopes to finally start construction within the year on Fenway Center, a five-building complex that will fill parking lots along the Massachusetts Turnpike, between Brookline Avenue and Beacon Street, with apartments, stores, and offices. The state is also constructing a new Yawkey commuter rail station at the edge of the property. Farther south on Brookline Avenue, developer William McQuillan has begun construction of the first new hotel in the area in several years, a Marriott Residence Inn. And around the corner on Boylston Street, four large mixed-use complexes would bring offices, hundreds of additional apartments, and new dining and retail options. “The Fenway is competing with all the best neighborhoods in Boston,’’ said Samuels, who over the last decade has helped build the mixed-use complexes Trilogy and 1330 Boylston. The 800 new apartments in those two projects are more than 95 percent occupied, with prices for one-bedroom units starting at about $2,200 a month. Over the years, the Red Sox have encouraged the development while also acquiring nearby properties to create a buffer around the ballpark. Team president Larry Lucchino said the new construction is just beginning to showcase the neighborhood’s potential. The recent burst of activity has broken a building slump that stretches back several decades. While the Longwood Medical Area and Back Bay grew up rapidly, the streets around Fenway Park remained largely unchanged, hosting the same tired collection of squat buildings and parking lots. But in the late 1990s, residents, business owners, and city officials began to construct a new plan for the area. They envisioned Boylston Street as a revitalized urban boulevard with wide sidewalks, new residences, and modern shops and restaurants. The zoning rules were changed to allow taller buildings, making it economically feasible for developers to pursue ambitious new projects. An obvious sign of the area’s success is its rapidly growing collection of dining and entertainment options. In addition to the House of Blues and sports bars such as Game On, the area has attracted restaurants such as Citizen Public House and the barbecue joint Sweet Cheeks - two restaurants whose menus are geared to serve the area’s new residents as well as Red Sox fans. A few weeks ago, another new restaurant, Yard House, opened on Brookline Avenue, offering 142 beer taps set against an ambiance that includes abstract paintings and a new patio that spills onto Van Ness Street. On Tuesday, Van Ness was teeming with activity. One construction crew was beginning to clear more property next to Yard House while a second group of workers was putting the finishing touches on yet another new restaurant called Happy’s. The casual American restaurant is the creation of Michael Schlow, who owns a group of restaurants that includes Via Matta in the Back Bay and Radius in the financial district. Schlow said he was attracted to the Fenway by a business environment that is finally beginning to reflect its diverse surroundings.